For the past year, BetaNYC has called on NYC government to be a global leader on algorithmic government. In the fall of 2017, CM Vacca introduced a bill that was turned into Local Law 49 of 2018. This #NYCAlgorithms LAW gives the city up to 24 months to create a task force and articulate how NYC can take that leadership. Today, a coalition of justice & data advocates release the following letter giving guidance to Mayor de Blasio. Just as we have done with NYC’s open data law, BetaNYC looks forward to helping this Administration and the City adopt the most forward thinking #NYCAlgorithms framework. The undersigned organizations and individuals write to offer recommendations regarding your anticipated appointments to the Automated Decision System Task Force, which is mandated by Local Law 49 of 2018. The task force is required to present the Mayor and ultimately the public with recommendations on identifying automated decision systems in New York City government, developing procedures identifying and remedying harm, developing a process for public review, and assessing the feasibility of archiving automated decision systems and relevant data. 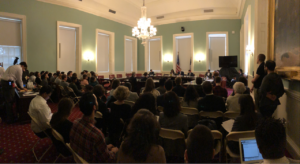 We are interested in ensuring the integrity and efficacy of the task force because government use of automated decision systems has broad and varied effects on New Yorkers, and the questions the task force must address are very complicated. We also anticipate that the task force’s prospective findings and recommendations can serve as a national or international model for other cities and states grappling with the opportunities and challenges presented by the use of automated decision systems. To that end, we offer the following recommendations on: (1) Issue and subject matter expertise that should be represented on the task force; (2) City agencies and specific staff that should be appointed or directed to cooperate with the task force; (3) Organizations, institutions, and individuals that should be appointed; and (4) Considerations regarding transparency and conflicts of interest. Computer Science and Data Science researchers including those with expertise in security, privacy, data management, data mining, and machine learning. Computer Science and Data Science practitioners, including those involved in open data initiatives and open source software development. Representatives from community-based organizations that represent communities most immediately affected by automated decision systems. Experts on New York City government agencies and operations, particularly criminal justice, education, housing, child welfare, public health. Experts in the disciplines of ethics, social science, philosophy, social work, and peer review. Legal practitioners or experts in data privacy, technology, surveillance, national security, civil rights, and criminal justice. If possible, we also recommend legal scholars with expertise on the European efforts at regulation government use of automated decision systems. To the extent possible, all appointees should publicly disclose any engagement, association, and present or prior grant funding from any vendors of automated decision systems used in New York City government. Appointees should also abide by the New York City Conflict of Interest Law. Avoid appointment of New York City agencies that may have or appear to have conflicts of interest because of pending litigation or public criticism regarding the use of automated decision systems. For this reason, we recommend avoiding appointment of the New York City Police Department, Mayor’s Office of Criminal Justice, and the Office of the Chief Medical Examiner. We understand that striking the right balance in the composition of this task force will be a challenge. Therefore, we welcome you to use the undersigned as resources during the appointment process and we extend the same offer to the subsequent automated decision systems task force chair and members.